The Swedish ban was lifted and the Heathens fans were delighted to welcome the return of Bernie Persson, together with Johnny Boulger they formed a formidable spearhead for 'United'. Howard Cole though decided to start a new life in New Zealand and Malcolm Corradine decided against making a comeback after his loan spell with Long Eaton. 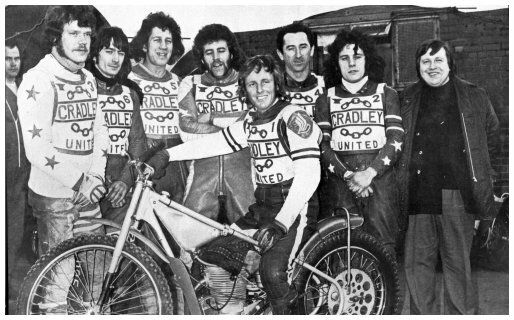 Arthur Price rode hard enough to make third heat leader though showed some inconsistency, these three were well supported by Bruce Cribb who showed some improvement after seasons of injuries, and Sandor Levai did all that was expected of him, two promising reserves in Russ Osborne (on loan from Boston) and Dave Perks completed the team with Steve Bastable being called upon when needed. Team Manager - Peter Worthington, On bike: - John Boulger. The season started quite sensationally too in April, the team walked out at Oxford after heat 7 during a blinding snowstorm the Heathens were fined and subsequently lost the match 58-14 by default then early in May they crushed Exeter (with captain Ivan Mauger) at the County Ground by 18 points, and followed up beating Kings Lynn 42-36 at Saddlebow Road. 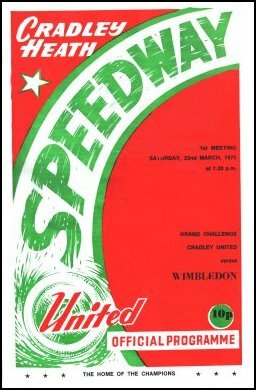 Cradley's inconsistency showed through again when they were thrashed by Hackney and Wimbledon who were two of the weaker teams in the League. Perhaps if they had been able to field a full team without guests they may have done better however they finished in their highest league position for many years with 32 points. The Heathens defeated Kings Lynn then Newport in the KO Cup but lost home and away to Belle Vue in the semi-final. Wolves beat Cradley in the Midland Cup and Dudley Wolves Trophy. They thrashed Teeside 52-26 in the first round of the Inter-League Cup but went out to Oxford in the next round. Malcolm Simmons showed his liking for Dudley Wood by taking the L.P.Trophy with 14 points - one point ahead of John Boulger and Bernie Persson. One great landmark was the Heathens win over Leicester in April, it was the first time the Heathens had beaten the Lions in a British League Match and then to rub it in they did it again a challenge match at the end of the season. Arthur Price 7, Dave Perks 7, Steve Bastable 6. Dave Perks 4, Steve Bastable 3, Sandor Levai 1.